Centrally located and completely renovated! Lovely two story Victorian home - 3 bedrooms, 2 full baths with central air. The perfect place to rejuvenate and indulge. Unwind in the hot tub among hydrangeas and roses. Breakfast on the sun porch. Dine at one of many Zagat rated restaurants. Walk barefoot on the beach. Sear steaks on the Weber grill. Decorated in soothing colors and designed for comfort and relaxation. Tall evergreens create a natural screen around the home providing an added measure of privacy. 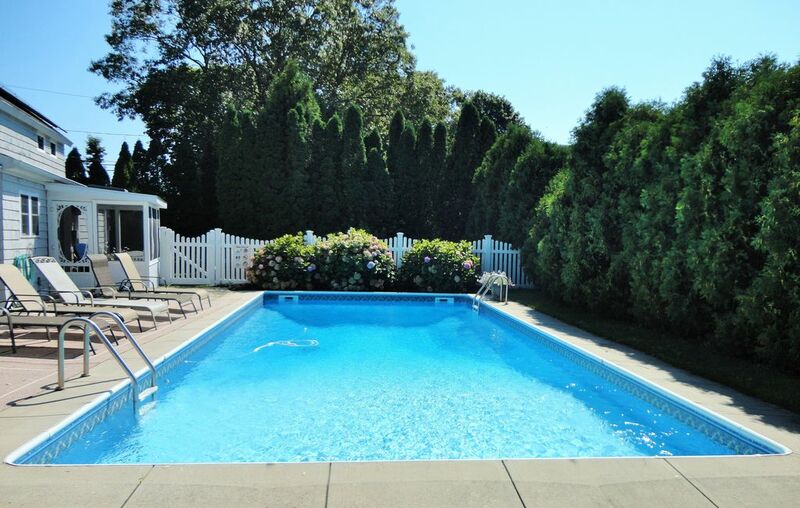 The 16X36 pool gives you plenty of room for laps or floating the day away. Just a short stroll from shops, restaurants, the bay and a Hampton Jitney stop. Beaches are only a 5-10 minute drive away. The main streets of West Hampton are a mere 10 minute drive. Vineyards are a 10-20 minute drive. Vacation in this centrally located, beautiful home and return to your life refreshed and invigorated. A perfect, private beach cottage for the whole family! Very clean, very neat 3 bedroom cottage. We loved the pool, hot tub and yard. The landscaping was lovely and created a private little oasis. The whole family and our friends were impressed and comfortable. "A little gem", they said. The owner was professional, thorough and courteous. She provided detailed information and instructions for using the house. The kitchen and bathrooms were immaculate. Sheets and towels were provided, as were beach chairs and pool floats. All appliances were updated and perfectly clean and functioning. And all the beds were deliciously comfortable! We loved having coffee in the screened porch while staring at the pool. One small suggestion: change all the sheets/comforters to white/cream. It will appear like a beautiful, modern B&B beach style. We are considering renting the cottage again next summer but for more days! Thanks, G.
Thank you for the great review. I really appreciate it. I used to have a lot more white bedding, but it became too difficult to get out stains. I opted for colors to make the turnover process go as quickly and smoothly as possible. It was a beautiful retreat. The property was like a private secluded park. The plants and flowers were so well taken care of- you knew the owner had taken a special interest in setting. We enjoyed our stay and the home was so comfortable and we had everything we needed to make our stay so special. We enjoyed the hot tub and pool and it helped us to relax. The beaches were close and easily accessible for us to walk and swim- absolutely beautiful. The Village was an easy walk for our guests to shop and enjoy the local restaurants. My guests were so comfortable and we are planning on returning next year. It is a fantastic place to relax and enjoy our time. Genoa was fantastic and was always quick to respond to any questions or concerns that came up. She is a truly committed owner with excellent customer service skills. It was a special time for all of my guests and myself! I am so glad you enjoyed your stay! Thank you for the lovely review. I can't tell you how much I appreciate it. The house is kept immaculately, from the beautiful manicured landscaping to the interior home. My family loved swimming in the pool and jumping to and from he hot tub back into the pool again. East qougue is a great central town to explore the hamptons from. Great place, very clean and charming. Perfect for 6 people. You have everything for Cooking, relaxing. Very nice swimming pool and jacuzzi. I recommend this place and Genoa is very reactive. Just perfect for holidays. So happy you enjoyed your stay. Thank you so much for writing this great review. I really appreciate it. Thank you so much for taking the time out to write such a wonderful review. I really appreciate it!! After spending a few days in New York this was the perfect place to relax for a couple of weeks. Pictures don't do house justice. Felt more like a home than a rental. Pool much bigger than we thought and was used every day. Was a little concerned at first that it wasn't heated but needn't have been. Was warmer than some supposedly heated pools we have had. Plenty of space both inside and out. Plenty of bathroom towels, pool towels and pool toys. Great to be able to walk to Sonnys, Goldbergs and restaurants/shops just round the corner. Would definitely recommend and would love to stay again!! I am so happy that you enjoyed your stay. Thank you so much for taking the time to write such a wonderful review. I really appreciate it.